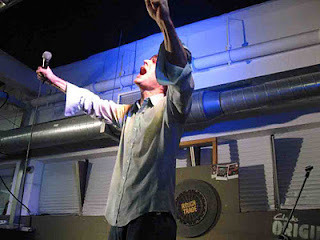 Watching John Maus perform a free show at Rough Trade East a few months back left me needing a lie down. Pacing around the stage like a crazed animal while repeatedly banging himself on the head, John's live show is pretty out there. A girl who I volunteer with has also seen him perform and this has led to us sometimes refering to crazy days in the office as 'John Maus' days. Since that show, I have found myself going back to his 2011 album 'We Must Become The Pitiless Censors of Ourselves' time and time again. His cover of Molly Nilsson's 'Hey Moon' really is quite something. Take a listen.